Have you heard about the jar of rocks concept? 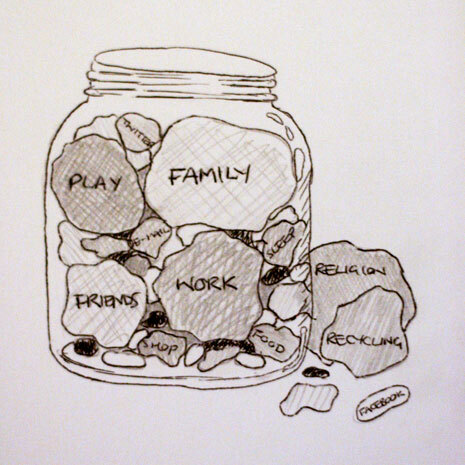 You have a jar and all that you can fit into a day is what fits into that jar. The most important things in your life (for example, yourself, your family, your health, your job, etc) are rocks, moderately important things are pebbles, and the trivial daily things that take up your time and energy are like grains of sand. Unless the rocks go into the jar first followed by the pebbles and THEN the sand, you’ll find that the jar gets filled with sand and the rocks and pebbles will never fit. Is your jar full of sand? Tomorrow you get to empty it out and start fresh!